Description: I/O-SYSTEM 750 is a complete field-side wiring system for bus terminals without definition of the final fieldbus. Combination of digital and analog I/Os with different potentials and signals within one fieldbus node. 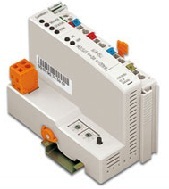 The ECO Coupler supports prominent protocols such as MODBUS TCP/IP and EtherNet I/P and accommodates 64 I/O modules.